Rice is a big deal in Nigeria. People love eating it. So the BBC's Ijeoma Ndukwe asks: why don't they grow more of it instead of importing so much? A long line of customers queue along a glass divide separating them from a rice food station at an eatery in Lagos, Nigeria's commercial capital. Diners can choose between white rice, fried rice and jollof at this popular local restaurant known as "The White House". A steady flow of customers is served in the main hall, and in two packed adjoining rooms diners are enjoying Nigerian dishes. 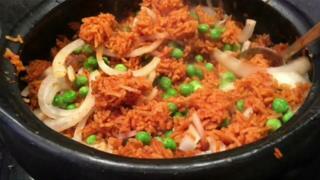 Rice is the basis of the popular national dish jollof and a staple across the country. The problem is not a lack of land, or that there are not enough people to grow it in Africa's most populous country. During the grain market crisis eight years ago, Nigeria experienced shortages in rice that made the country rethink its food security and ability to supply the local market. As a result, President Muhammadu Buhari has made rice farming a priority. Nigerians' appetite for rice means that the country imported nearly 17 million tonnes of it over the past five years. Duties for imported rice are currently 60% and consumers have seen the price of a bag of rice double in the past 12 months. Many domestic players have been entering the market. Olam, a multi-national agribusiness, set up a rice farm in 2012 in response to government calls for local players to help feed the 170 million Nigerians. It is a bumpy journey to Olam's farm in Rukubi village close to the Benue River in Nasarawa State. The lush green fields of the farm are an oasis among miles and miles of dusty red road and bushes. Large metal silos carrying 228,000 tonnes of rice rise up from the ground, gleaming in the scorching afternoon sun. Manager Anil Nair, drives us around 4,500 hectares of the farm and mill. Most of the farm hands have finished work for the day. They usually work in the rice paddies from 07:00, before the sun gets too hot. Only a few women remain, standing ankle deep in the paddies, planting rice seedlings. This is one of the largest rice farms in Nigeria and although it grows 50,000 tonnes each year, that is still just a small fraction of the country's demand. According to the United Nations Food and Agriculture Organisation (FAO), the country imported 2.3 million tonnes in 2016, about half of the country's estimated requirements. "We can't afford $5m a day for rice shipments in this country. It's gone on for 40 years. And I assure you that it's our reckless policy of importation that's brought Nigeria down to where she is now. Those who keep talking of imports either don't mean Nigeria well or simply refuse to recognise the fact that we can't afford the imports." However, most farmers in Nigeria are small scale and struggle to get the financing they need to improve farming methods and boost their yield. 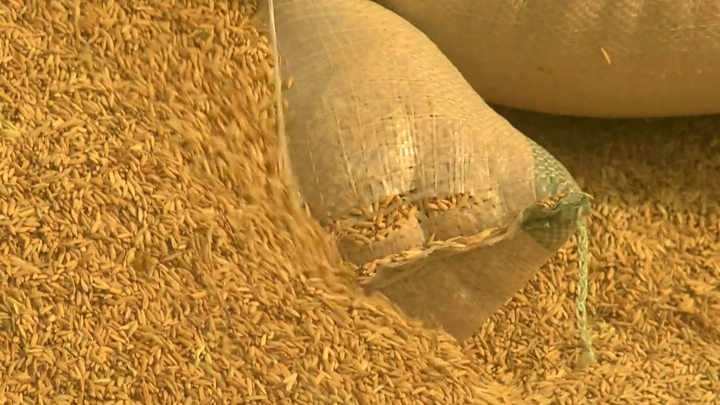 Members of the Rice Farming Association of Nigeria say they can only access high-interest loans from commercial banks. Joseph Jatau Kudu has been farming near the town of Doma in Nasarawa State since 1982. He says the banks charge as much as 30% to lend money. "It's too high. We end up earning nothing," he says. Without the capital to mechanise, workers must do everything on his 15-hectare farm by hand. "Sometimes the tractors are not available. So now I'm using manual labour. It's not as effective as in the case of using a tractor and it's one of the reasons I can't expand." The agriculture minister claims that Nigeria will become self-sufficient in rice production by the end of the year. However, critics of government policy not only point to a lack of spending on agriculture, but also to an under-investment in the entire value-chain for rice, from field to cooking pot. Ninety two billion naira ($302m; £240m) was assigned to the sector in the 2017 budget - only 1.26% of the entire budget for the year. AgroNigeria's Managing Director Richard Mbaram says that achieving self-sufficiency in the next couple of years is merely a "pipe dream". "Rice production isn't willed into existence. It is cultivated and systematically sown. "There is research, there is mechanisation, there is warehousing and storage. There is market opening and market access. "You cannot drive industrialisation or agro-industrialisation without connecting the farm gate where the production is happening. Do we have that? We're very far back in terms of achieving that." In the meantime, Nigerians' appetite for rice shows no sign of slowing down. Nigeria's tomato crisis: Can you make stew without tomatoes?